The Minister of State for Information & Broadcasting, Col. Rajyavardhan Singh Rathore addressing at the inaugural ceremony of the BES EXPO 2016, in New Delhi on February 04, 2016. 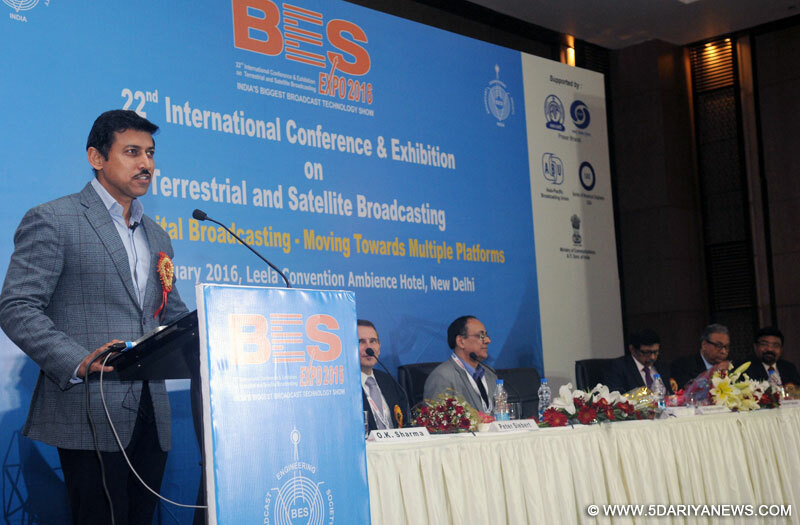 Minister of State for Information and Broadcasting, Col. Rajyavardhan Rathore said that BES EXPO 2016 provided a unique platform and opportunity for participants and concerned stakeholders from across the world to share their ideas and experiences on the opportunities and challenges of the new age of digital broadcasting. He said that an idea would not be revolutionary if it remains dormant and BES EXPO 2016 provided an excellent forum to discuss these ideas and learn from each other. The Minister stated this, today, at the inaugural ceremony of the 22nd International Conference & Exhibition on Terrestrial and Satellite Broadcasting – BES EXPO 2016. Shri. Dr. A. Surya Prakash, Chairman, Prasar Bharti, Shri. JawaharSircar, CEO, Prasar Bharti and Shri J.S.Mathur, Special Secretary, Ministry of I&B were also present on the occasion. Speaking on the occasion, Col. Rathore said that our country was associated with the pre-history of radio and broadcasting and would remain associated to the future of broadcasting. He further said that, however, with rapid changes in the information &communication technology and increasing number of smartphone users in India, the challenge as well as the opportunity would be to develop content and services for such platforms and consumers. laborating further, he said that Public Broadcaster was aware of the new challenges and would be constantly striving to keep pace with the new age technologies. The Minister also mentioned that the laws of the land should learn to keep pace with changing technology. Healso complimented the Broadcast Engineering Society (BES) for their efforts and initiatives in bridging the gap between educational institutions and professional bodies.Special Secretary (I&B), Shri J.S.Mathur said that the BES EXPO which is amongst the top 5 exhibitions in the Knowledge Hub category provided an excellent opportunity for the whole of the broadcasting industry to witness the new technology from across the world in India. The Minister of State for Information & Broadcasting, Col. Rajyavardhan Rathore along with the other dignitaries present on the occasion felicitated the winners of the awards constituted by Broadcast Engineering Society in various categories such as training and innovation. The life time achievement award was conferred to Shri M.S.H. Baig for his outstanding contributions to the broadcasting industry.This year the society also conferred two special category awards to All India Radio for its Mobile App- ‘AIR Live’ and Doordarshan for its impactful coverage of Republic Day Parade, Independence Day, International Yoga Day and Ekta Diwas.